Hans Schoening was born circa 1853 at Prussia. He was the son of (?) Schoening. John James Fenelon married Flora E. Irwin. John James Fenelon was born on 20 June 1861 at Wisconsin. Married Name Her married name was Fenelon. Flora E. Irwin married John James Fenelon. Willard Byron McClain was born on 27 March 1927 at South Dakota. He was the son of Henry Clyde McClain and Ruby J. Houston. Willard Byron McClain died on 25 January 1997 at Concord, Contra Costa, California, at age 69. [S250] U.S. Federal Census 1930 U.S. Federal Census, by Ancestry.com, ED7. Dwelling 1b. Gerald Keith Palmer was born on 6 May 1933. He was the son of William Melvin Palmer and Bertha May McClain. Gerald Keith Palmer died on 20 May 1995 at age 62. James Elmore was the son of John Elmore. James Elmore witnessed the marriage of John Francis Elmore and Amy Travis in 1914 at Meade, South Dakota. Horace Mercer was born circa 1869 at Indiana. He was the son of Levi D. Mercer and Missouri E. McIntosh. [S246] U.S. Federal Census 1880 U.S. Federal Census, by Ancestry.com, NA Film Number T9-0285 Page Number 405C. Claire Mercer was born circa 1871 at Indiana. She was the daughter of Levi D. Mercer and Missouri E. McIntosh. Leora Mercer was born circa 1873 at Indiana. Harriet A. Mercer was born circa 1875 at Indiana. Marshall Mercer was born circa 1879 at Indiana. William Chapman was born circa 1862 at Ohio. Isabell Chapman was born circa 1865 at Ohio. She was the daughter of Robert Ross Chapman and Mahala Josephine Mercer. Laura Chapman was born circa 1867 at Ohio. Mary Chapman was born circa 1869 at Ohio. Alice Chapman was born circa 1872 at Ohio. John B. Chapman was born circa 1877 at Ohio. Otto E. Breitzke was born on 16 August 1901 at Ableman, Sauk, Wisconsin. He was the son of John Michael Breitzke and Augusta Henrietta Breitzke. As of 1940, Otto E. Breitzke was never married. He died on 19 November 1988 at Dane, Wisconsin, at age 87. Otto E. Breitzke and Arthur Edward Breitzke were confirmed on 28 March 1915 at St John Lutheran Church, Reedsburg, Sauk, Wisconsin. [S243] U.S. Federal Census 1920 U.S. Federal Census, by Ancestry.com, Year: 1920; Census Place: Madison Ward 6, Dane, Wisconsin; Roll: T625_1981; Page: 10A; Enumeration District: 54; Image: 814. [S373] U.S. Federal Census 1940 U.S. Federal Census, by Ancestry.com, Year: 1940; Census Place: Madison, Dane, Wisconsin; Roll: T627_4469; Page: 2B; Enumeration District: 13-54. Meta A. Breitzke was born on 11 February 1903 at Ableman, Sauk, Wisconsin. She was the daughter of John Michael Breitzke and Augusta Henrietta Breitzke. 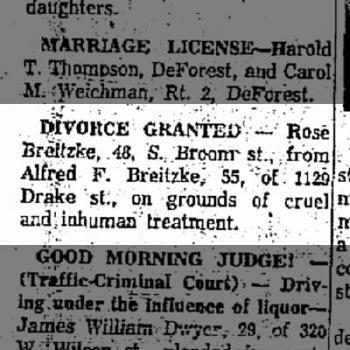 As of 1940, Meta A. Breitzke was never married. She died on 29 July 1990 at age 87. Meta A. Breitzke obtained US Social Security Card at Wisconsin; last residence not specified. Name Variation Harry Clarence Breitzke was also known as Harry E.
Name Variation Harry Clarence Breitzke was also known as John. Harry Clarence Breitzke was born on 11 June 1905 at Ableman, Sauk, Wisconsin. As of 1940, Harry Clarence Breitzke was never married. He died on 18 February 1991 at Dane, Wisconsin, at age 85. Name Variation Alfred Ferdinand Breitzke was also known as Alfred Aug.
Alfred Ferdinand Breitzke was born on 11 January 1907 at Excelsior, Sauk, Wisconsin. Alfred Ferdinand Breitzke married Rose (?) before 1962. Alfred Ferdinand Breitzke and Rose (?) were divorced in January 1962. Alfred Ferdinand Breitzke died on 16 February 1995 at Dane, Wisconsin, at age 88. Married Name Her married name was Hein. 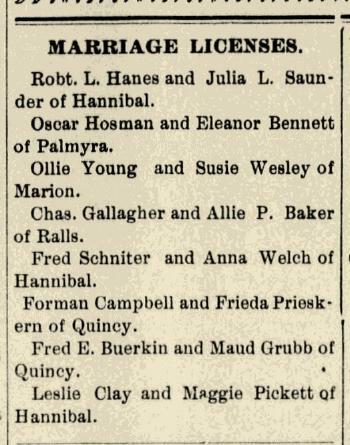 Clara Schneider married James Bernard Hein, son of Julius Charles Hein and Susan May Lafler. Clara Schneider was born on 31 December 1904 at Illinois. Name Variation Forman Thomas Campbell was also known as Foreman T.
Name Variation Forman Thomas Campbell was also known as F. T.
Name Variation Forman Thomas Campbell was also known as Thomas. Name Variation Forman Thomas Campbell was also known as Ferman. 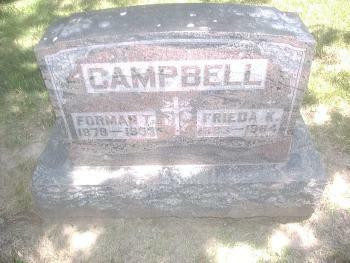 Forman Thomas Campbell was born on 30 October 1879 at Ursa Township, Adams, Illinois, also reported as Oct 1878. He was the son of Francis Marion Campbell and Jennette Jane Furbe. 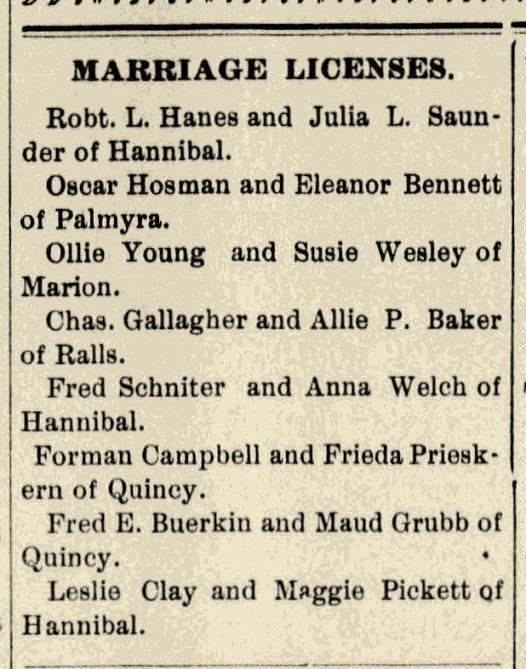 Forman Thomas Campbell and Frieda K. Prieskorn obtained a marriage license in August 1905 at Missouri Marriage license of Forman Campbell and Frieda Prieskorn of Quincy. Forman Thomas Campbell married Frieda K. Prieskorn, daughter of Charles Prieskorn and Louise Carolina Adolphina Marie Arndt, in August 1905. Forman Thomas Campbell died on 14 April 1933 at Jacksonville, Morgan, Illinois, at age 53 53y 5m 15d; also reported as 04 Apr 1933. He was buried after 14 April 1933 at Greenmount Cemetery, Quincy, Adams, Illinois, Double Stone with Frieda CAMPBELL WHITLEY. 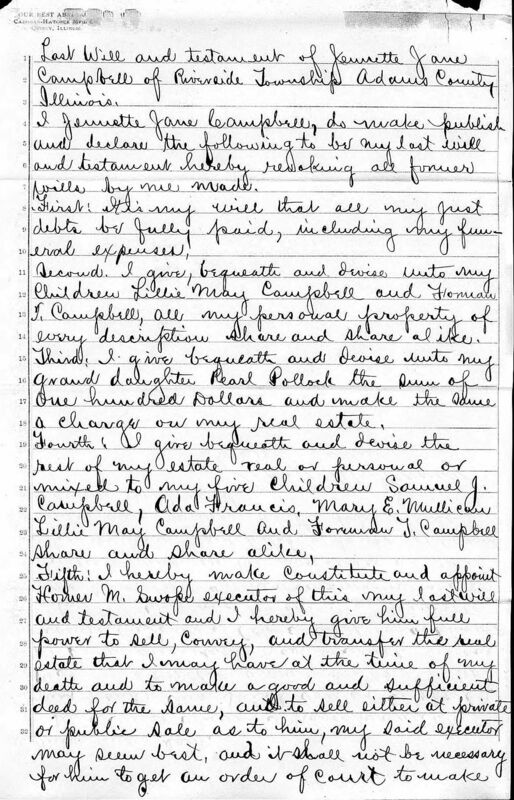 In Jennette Jane Furbe's will dated 3 October 1900, Forman Thomas Campbell was named as an heir. He lived in 1908 at 216 Lind, Quincy, Adams, Illinois, occupation: laborer. He lived in 1916 at 224 York, Quincy, Adams, Illinois, occupation: gas fitter. He was a car carpenter in September 1918 at Chicago, Burlington, Quincy Railroad, Quincy, Adams, Illinois. On 12 September 1918 at World War I Draft Registration, Quincy City, Adams, Illinois. In Mary E. Campbell's will dated 23 August 1921, Forman Thomas Campbell was named as an heir. He lived in 1926 at 224 York, Quincy, Adams, Illinois. On 20 September 1931 at Sauk, Wisconsin, Mr. and Mrs. Fred Mercer have had as their guests during last week Mr. and Mrs. Dwight Mercer of Beloit, and Mr. and Mrs. Forman Campbell, of Quincy, Ill. He was a Gas Fitter in 1933. Name Variation Francis Marion Campbell was also known as Frank. Nickname Francis Marion Campbell also went by the name of Whig. Name Variation Francis Marion Campbell was also known as F. M.
Francis Marion Campbell was born on 6 February 1836 at Illinois. He was the son of George Campbell and Mary Groshong. Francis Marion Campbell was buried in 1898 at New Providence Cemetery, Adams, Illinois. He died in 1898 at Adams, Illinois. In 1863 at Civil War Draft Registrations, Ursa, Adams, Illinois, single. [S249] U.S. Federal Census 1850 U.S. Federal Census, by Ancestry.com, 312b. Dwelling 222. [S248] U.S. Federal Census 1860 U.S. Federal Census, by Ancestry.com, Page 389. Dwelling 2873. [S247] U.S. Federal Census 1870 U.S. Federal Census, by Ancestry.com, Page 31. Dwelling 250. Name Variation Jennette Jane Furbe was also known as Furbee. Name Variation Jennette Jane Furbe was also known as Janett. Name Variation Jennette Jane Furbe was also known as Jannettie. Name Variation Jennette Jane Furbe was also known as Furby. Name Variation Jennette Jane Furbe was also known as Jannettie Jane. Name Variation Jennette Jane Furbe was also known as Genetta. Name Variation Jennette Jane Furbe was also known as Jeanette. Married Name 23 August 1865 As of 23 August 1865,her married name was Campbell. 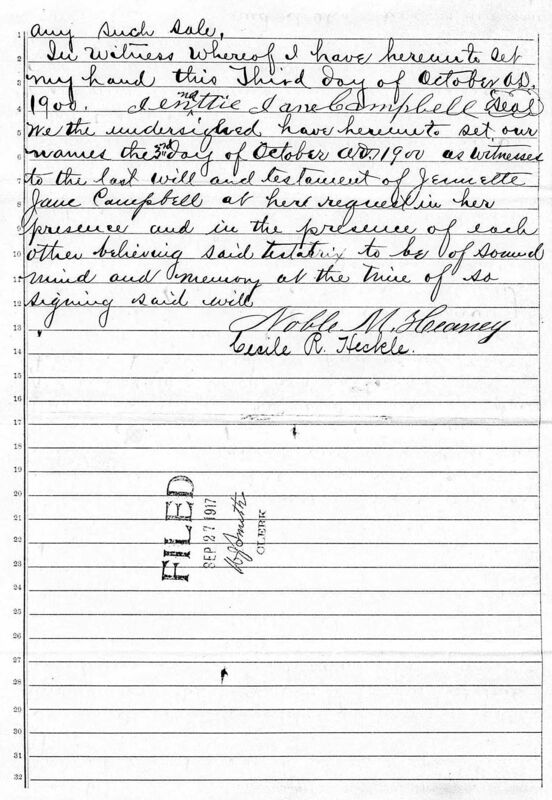 Jennette Jane Furbe was born on 2 July 1844 at Zanesville, Muskingum, Ohio, also reported as 1850. She was the daughter of (?) Furbe and unknown (?). Jennette Jane Furbe died on 21 September 1917 at Quincy, Adams, Illinois, at age 73 Mrs. Jeannette J. Campbell, widow of Francis M. Campbell, died Friday afternoon at 3 o'clock in the residence, 703 North Fifth street, from complications, having been ill since February. She was born in Zanesville, Ohio, July 2, 1844, and was 73 years old. She came to Adams county in 1862, and had been a resident of this city (Quincy) since March 25, 1914, the greater part of her life being spent on a farm in Riverside township. On August 13, 1864, she was married to Francis Campbell of Ursa, who died 19 years ago. She is survived by two sons, Samuel J. and Foreman T., of this city, and three daughters, Mrs. Ada Greever of Ellington township, Mrs. Mary E. Mulligan Cochran of Milan, Mo., and Miss Lillian Campbell, at home. Funeral services for Mrs. Jeannette Campbell will be held Monday morning at 9:30 o'clock from the residence, 703 North Fifth street, and at 1 o'clock from the Christian church at Ursa, with burial in New Providence Cemetery. 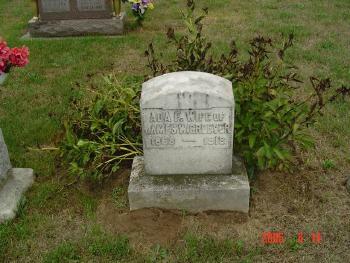 She was buried after 21 September 1917 at New Providence Cemetery, Ursa, Adams, Illinois. Jennette Jane Furbe had 5 with 5 living in 1900 children. She left a will on 3 October 1900. [S248] U.S. Federal Census 1860 U.S. Federal Census, by Ancestry.com, Roll: M653_632; Page: 0; Image: 405. Name Variation Samuel Jackson Campbell was also known as S. J.
Samuel Jackson Campbell was born on 1 March 1866 at Illinois. Samuel Jackson Campbell died on 11 April 1952 at Adams, Illinois, at age 86. He was buried on 14 April 1952 at Greenmount Cemetery, Quincy, Adams, Illinois. 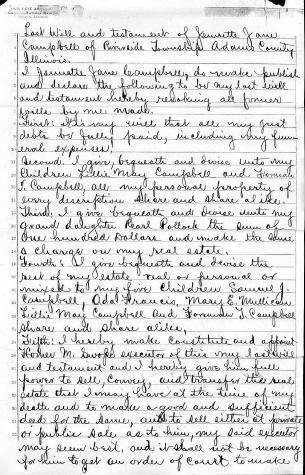 In Jennette Jane Furbe's will dated 3 October 1900, Samuel Jackson Campbell was named as an heir. In Mary E. Campbell's will dated 23 August 1921, Samuel Jackson Campbell was named as an heir. Ada Francis Campbell was born circa 1868 at Illinois. Ada Francis Campbell died on 22 June 1918 at Quincy, Adams, Illinois, Mrs. Ada Greever, wife of James Greever of Ellington township, died Saturday evening in Blessing hospital following a lingering illness from cancer. She was 50 years old and was the oldest daughter of the late Mr. and Mrs. F. M. Campbell, pioneer residents of Ursa township. She was a member of the Lutheran church in Burton. Besides her husband she leaves one daughter, Erma by a former marriage; two brothers, S.J. Campbell and F.T. Campbell; and two sisters, Mrs Mary Cochran and Miss Lillie Campbell all of this city. Funeral services for Mrs. Greever will be held Tuesday morning at 9:30 o'clock from the residence 701 Jersey street. Burial will take place in the New Providence cemetery at Ursa at 11 o'clock. She was buried after 22 June 1918 at New Providence Cemetery, Adams, Illinois. In Jennette Jane Furbe's will dated 3 October 1900, Ada Francis Campbell was named as an heir. She had 1 with 1 living in 1910 children. [S186] Illinois, Illinois Statewide Marriage Index, license 00007039. 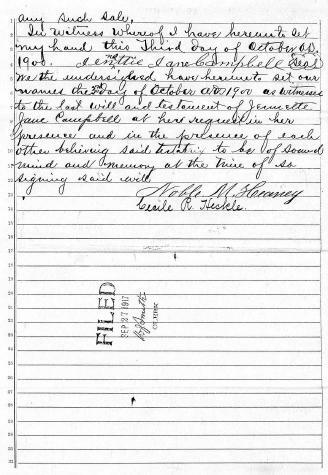 [S4] Illinois, Illinois Marriages to 1850, This record can be found at the County Court Records, Film # 1845384 -1845385. [S186] Illinois, Illinois Statewide Marriage Index, license 00007039. This record can be found at the County Court Records, Film # 1845384 -1845385. [S244] U.S. Federal Census 1910 U.S. Federal Census, by Ancestry.com, ED114. Dwelling 254.